The FD150 fold down bollard from Barrier Security Products is an efficient solution for car park space protection and vehicle access control in shopping malls, lane ways and sporting venues. 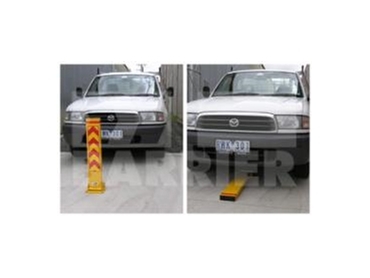 The FD150 fold down bollard has been designed for vehicle access control and parking space protection. In the upright position, the fold down bollard stands 800mm high with a broad face of 150mm wide for greater visibility. In the lay flat position it is only 80mm high, allowing vehicles to drive over it without fouling. The Fold Down Bollard has an optional reflective sign face available to enhance visibility at night and underground car parks. The fold down bollard comes complete with fixings and padlock.